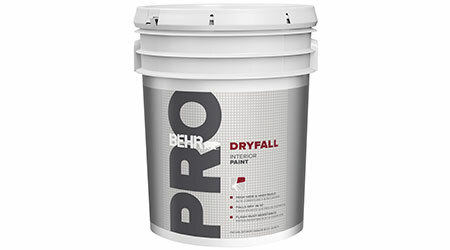 BEHR PRO DryFall Paint is a high-hide, high-reflectance acrylic coating formulated specifically for airless spray application and offers flash rust resistance. It settles into a sweepable dust within ten feet from ceiling surfaces. BEHR PRO Dryfall Paint is suitable for use on drywall/gypsum board, concrete, plaster, wood, ferrous, and non-ferrous metals. Greenguard certified.